These are just a few reasons why some women experience hair loss or thinning hair and many of us will experience one or more of the symptoms above regardless of how hard we try not to. We should all know by now that we all lose around 50 to 100 hairs a day. Most of us are used to a few hairs falling from combing, styling, washing, etc. For those of us wearing protective styles you see very little until it is time to take down the style. That is because when you do not manipulate your hair daily you end up with tons more when you finally take the style down. That happens becuase as many of those shed hairs have been trapped in the style and finally become released. Outside of protective styles some women are seeing a lot more hair falling out than normal. It can be one of the reasons above or something else entirely but when it does occur one can become scared, embarrassed, depressed or all of the above. 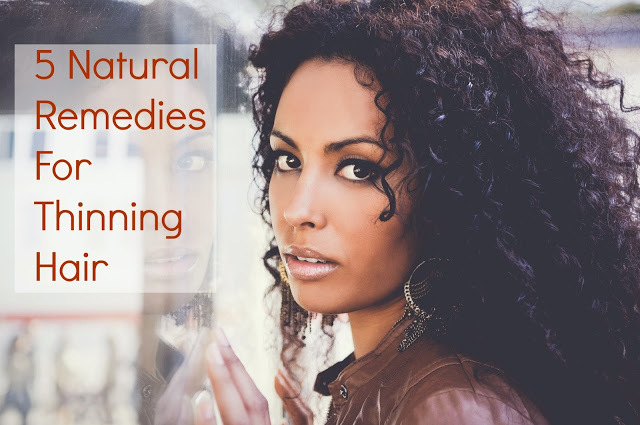 It may seem like contacting a Dermatologist or a Trichologist is the answer for most but if you want to at least try a few natural options before seeking professional help here are a few natural remedies that have been said to combat hair loss and/ or thinning hair. First off, reevaluate your eating, drinking, sleeping and exercising. What are you putting into your body that may be causing this hair loss? Whether you are crash dieting, stressed over work, family or a relationship, or not sleeping; all of these can affect your health and cause hair loss. This is the simplest and quickest way to solve the problem outside of meds and even if none of these are causing your hair loss; eating healthier, getting enough sleep and exercising will positively affect your overall well-being. Herbal and tea rinses have been used for years as remedies for hair loss. Many contain anti-inflammatory, anti-viral or anti-microbial properties that can thwart scalp ailments and make the hair’s environment healthier for hair growth. Horsetail stimulates blood vessels in the scalp, promoting growth of new hair. Stinging nettle stimulates growth of new hair while at the same time inhibiting the production of DHT – the hormone primarily responsible for male- and female-pattern baldness. Bhringraj is an ancient Ayurveda herb considered to be one of the best natural remedies for revitalizing dormant hair follicles. These are just a few that can aid in revitalizing your hair’s follicles and allow for healthy hair growth. There are several essential natural oils like Rosemary which are known for their promoting hair growth. Add them to a carrier oil that will also assist and use as a scalp massage to the affected areas or your entire scalp. For one it is soothing to do and relaxes you (especially if stress is on of the components of your hair thinning) but it also stimulates the hair follicles. “Use your fingertips and a bit of Argan or coconut oil to rub in a circular motion for several minutes before you shampoo,” says John Masters, owner of John Masters Organic Salon. Mary Lupo, MD, a clinical professor of dermatology at Tulane Medical School. With our without the essential oil, oil massages will increase circulation to the scalp and that may give the hair follicles the nutrients they need for hair growth. Garlic oil contains allicin, a natural substance that can improve blood flow to the scalp, get rid of any bacteria or fungi living on the scalp and hair, and give life to damaged follicles. Garlic nourishes hair by stimulating blood flow to the scalp. You can use it directly on the scalp or by using hair products that contain garlic in them for hair shedding. To make your own garlic additive for shampoo or conditioner, crush up a clove with a press or a mortar and pestle, then mix it with the amount of shampoo or conditioner you intend to use. Be sure to give your scalp a good massage as you work the product through your hair, then rinse. Aloe vera contains enzymes that directly promote healthy hair growth and with its alkalizing properties can help bring the scalp and hair’s pH to a more desirable level, which can greatly promote hair growth. Aloe Vera gel contains polysaccharides and glycoproteins, and some believe they can stimulate new skin growth. Aloe Vera is an excellent natural moisturizer and skin conditioner. It can reduce flaky, itchy scalp and reduce dandruff and this can make the scalp a more conducive environment for healthy hair growth. There is nothing better than sound medical advice so if you feel a natural remedy is not the answer or if you have tried one of these solutions with no change then seek a medical professional. What do you use for thinning hair?